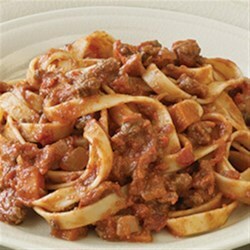 "For a quick weeknight dinner, this Bolognese sauce with ground beef and veggies, beef broth or wine is a perfect dish for families on the go." Brown beef, bacon, onion, celery and carrots in a large saucepan over medium-high heat until browned and crisp, about 10 minutes. Add broth; simmer until evaporated, scraping browned bits from bottom of pan. Stir in tomatoes and milk. Simmer over medium-low heat until sauce is thickened, about 15 minutes. Serve over pasta. Very simple and delicious, but needs a bit more kick to it. Followed directions with one exception and that was adding some marsala wine to deglaze the pan first before adding the beef broth. very nice , all the family like it,.